Orchard House01263 715779work01603 870304fax Self-cateringThis beautiful house enjoys a south facing garden with a lovely patio area. The interior is tastefully decorated and includes comfortable seating and modern utilities. The beach is only three miles away and a great selection of walkways are available for guests to explore. The local amenities are fairly close and the village lies on the Peddars Way. Orchard House is situated in a quiet position on the outskirts of the village and benefits from a large secluded garden. It provides attractively furnished, spacious accommodation and is ideal for a family holiday. 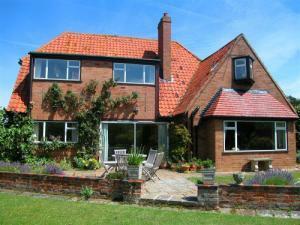 This beautiful house enjoys a south facing garden with a lovely patio area. The interior is tastefully decorated and includes comfortable seating and modern utilities. The beach is only three miles away and a great selection of walkways are available for guests to explore. The local amenities are fairly close and the village lies on the Peddars Way. Situated on the B1153 outside Ringstead. From King''s Lynn - 16 miles.